A festive-looking accompaniment for almost any holiday main course. Cut cauliflower into bite sized florets. Place on a large baking sheet and toss with 2 tablespoons olive oil, salt and pepper. Roast for 10 minutes. Remove cauliflower from oven. Add 1/2 cup of the French fried onions to the cauliflower on the baking sheet and toss. Place remaining 1/4 cup onions off to one side of the baking sheet (these will be used as garnish). Roast mixture an additional 10 minutes or until cauliflower reaches desired tenderness and onions are brown and crispy. In a small bowl, combine ricotta cheese with 1 tablespoon olive oil, salt and pepper to taste. Set aside 2 tablespoons each of dried cranberries and pistachios (these will be used as garnish). 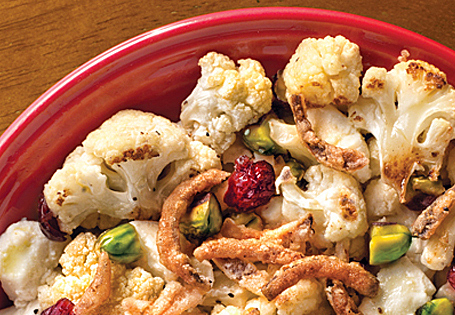 In a medium bowl, toss warm cauliflower mixture with dried cranberries and pistachios. Spoon ricotta mixture on top and fold gently, leaving large bits of ricotta. Garnish with reserved cranberries, pistachios and crispy onions. Serve immediately.